I hadn’t been to the 94th Aero Squadron in years, and it brought back so many good memories. This time around I was there to photograph Marivi’s baby shower. First of all a big “thank you” to my friend and wonderful photographer, Melissa from Simply Captivating Photography for the referral. Marivi is not only beautiful, but has a wonderful personality and a contagious laugh that makes being around her an absolute delight. She is also a Virgo, like myself, so needless to say, we hit it off from the moment we spoke on the phone. 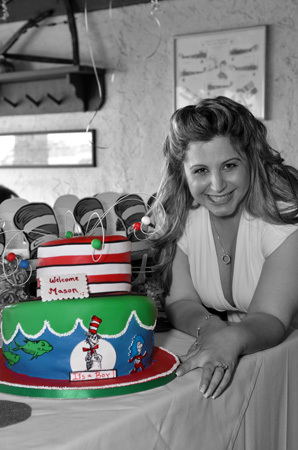 The theme of the shower was Dr. Seuss. The decorations were colorful and fun, and everyone got into character as soon as they walked in. We all wore red and white hats, enjoyed a nice lunch, played games and opened lots of nice presents. Marivi was surrounded by family and a group of very fun friends who kept the party lively, I really enjoyed being there with all of them. Everyone is very excited about baby boy Mason and can’t wait to meet him. Congratulations to all!! !